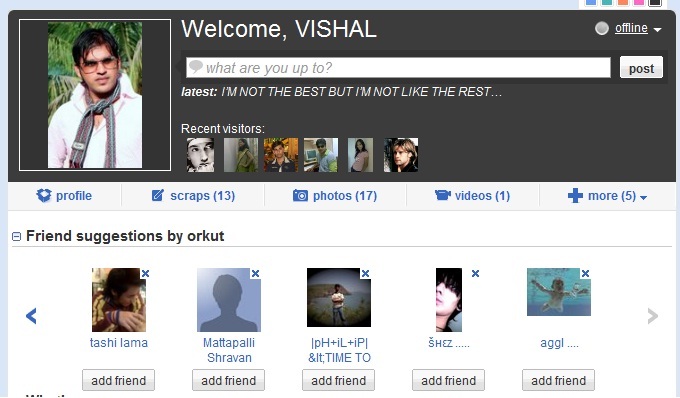 Orkut is one of the most popular social networking website. Google team has announced the launch of a brand spanking new version of orkut on wednesday.The site has been rebuilt from the bottom up using the Google Web Toolkit (GWT).Google has gathered chat, videos and search options within full friends and communities at the home page of Orkut. Now you can chat, watch videos, and browse and search within your full friends and communities lists without ever having to open a new page. Look out for larger pictures, easier to access notifications, targeted friend suggestions, and key updates closer to the top of your homepage. Make your orkut profile and homepage truly your own by choosing the color that best fits your style. Users are also able to edit their orkut profile and “about me” sections and homepage their own by choosing the color that best fits their style. 1. Join Poppy and Shashi on the official community (www.orkut.co.in/neworkut) for insights into the new version of orkut and participate in one of the many activities that will be taking place there. Be sure to check back often as the owners will be regularly announcing new ways to get access. that will appear on your friends’ profile pages, next to their names. Give this a try and use new version of Orkut, don’t forget to share your feedback about new version. You can also share Invitations of new version of orkut. Update : Finally I got the new look for my orkut profile. Posting a screenshot here.